This will allow space for the air to circulate the fibers within the Mini Flocker. Gently slide the other tube (with the holes) over the one filled with fiber. With theMini Flocker filled approx. 1/2 full, pump the unmarked cardboard tube continuously using a twisting motion. The twisting will help move the fibers inside the applicator while the pumping will blow them out. 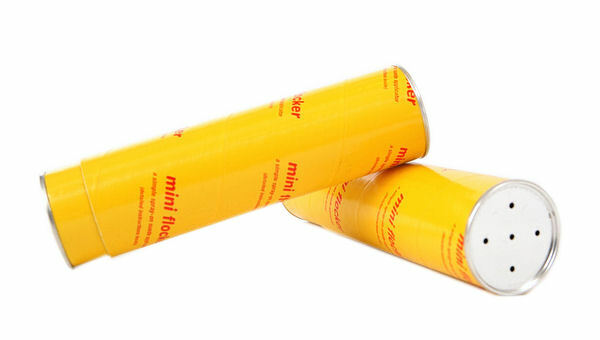 Hold the Mini Flocker 8" to 10" from your project on an angle of 45 to 90 degrees to apply the fibers. Apply more fibers than you think you need and then some more. You cannot overcoat—only so much will stick. Excess fibers may be reclaimed and reused. Best for use on horizontal projects.